The Second Central Asia and South Caucasus (CASC) Sub-regional Platform for Disaster Risk Reduction of the United Nations will be held in Yerevan from 26 to 27 June. This is the first time a regional meeting is held in Armenia. The goal is to discuss the activities carried out towards the reduction of damages caused by disasters and to increase their volumes. It aims at addressing key issues that can boost the implementation of the Sendai Framework in coherence with the Sustainable Development Goals (the SDGs), Paris Agreement taking into account the theme of the 2018 European Forum for Disaster Risk Reduction taking place in Italy and 2019 Global Platform. The sub-regional platform will host representatives from Central Asia and the South Caucasus countries, bringing together ministers, mayors, private sector representatives, international organizations and civil society representatives from Armenia, Azerbaijan, Georgia, Kazakhstan, Kyrgyzstan, Tajikistan, Turkmenistan and Uzbekistan within the framework of the topic “An Integrated Platform for Sustainable Development and Building Resilience”. While taking stock of the 2016 Central Asia and South Caucasus Roadmap for implementation of the Sendai Framework, this year’s sub-regional platform will address some of the below issues: promoting sustainable and resilient development in the region, from monitoring progress to implementing strategies, promoting effective public private partnerships towards risk sensitive investment, understanding risks and accounting for losses – the economy of disasters, land-use and urban planning for risk informed decisions, an all of society approach to build resilience, etc. The 2nd CASC Sub-Regional Platform will serve as instruments to forge partnerships, periodically assess progress on implementation, share practice and knowledge on risk-informed policies, programs and investments, including on development and climate issues, promote the integration of disaster risk management in other relevant sectors. 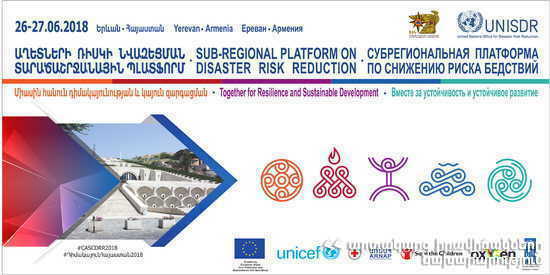 Below see the details of the UN Sub-Regional Disaster Risk Reduction Platform to be held on June 26-27, in Yerevan.